The second highest of the Seven Summits and the highest mountain outside the Himalaya. The second highest of the Seven Summits, Aconcagua is often referred to as the “highest trekking peak in the world”, as it can be climbed by fit walkers without roped mountaineering experience. However, even the ‘normal’ route via the Horcones Valley is an extremely arduous ascent due to the scale of the mountain, altitude and the unpredictable weather. Dates 2019: 06 january – 27 january. Minimum level required: level 1 in mountaineering ability levels - fitness level 4.
the cost include: services of an Europea Mountain Guide and an local Mountain Guide, local transport as per program, lodging and tent fees, full board in the mountain except lunches and evening meals in Mendoza, group equipment, mules, first aid kit for both the guide and yourself. The guide will book all Hotel as per program – you pay for these direct as we we go along. The cost not include: Personal equipment, lunches and evening meals in the town, permit for Aconcagua National Park, snacks and drinks, International flights, airport tax and entry visa (where necessary), holiday Insurance (must include cancellation), Medivac (Medical & Emergency Evacuation), insurance, ICE fees (rescue team working, helicopter flights, drawing of supporting documents, repatriation), telephone, any extra days waiting for weather and anything not specified. Trip meeting point: Mendoza Airport. Arrive in Mendoza.Fly via either Santiago or Buenos Aires, depending on the best flight schedule. Arrive in Mendoza in the early afternoon. We are met at the airport by a private bus for transfer in hotel. night in hotel. Mendoza . All equipment and food receives final checks and the group prepares loads for carrying up the mountain. Night in hotel. Drive to Los Penitentes 2600m. Complete permit applications at the Aconcagua National Park headquarters and drive for four hours to Los Penitentes. Overnight in lodge. Trek to Confluencia 3395m. Drive to National Park entrance and trek to the first campsite at Confluencia 4 hours. Overnight camp. Acclimatisation trek to Plaza Francia. Today, you hike towards the foot of the South Face of Aconcagua. Apart from giving you stupendous views, the hike will take you to over 4000m, which will assist your acclimatisation. Return to Confluencia. 6 – 7 hours. Overnight camp. Trek to Plaza de Mulas 4365m. This is a tough day, taking about 8 hours to reach base camp. At base camp there will be a mess tent dedicated to our team, which you can use at any time – for meals, for meetings, for socialising or for simply passing the time of day. Overnight camp. Acclimatisation and Rest Day at Base Camp. This is a very important day, as some team members will still be feeling the strain of the new altitude after the previous day’s hard walking. Overnight camp. Climb Bonete Peak 5004m. This is a great day out, culminating in your first successful summit, and giving the most brilliant views of Aconcagua on the opposite side of the valley. Overnight in the tents. 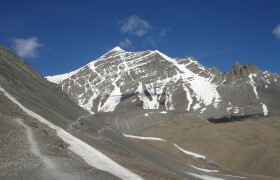 Camp 1, Canada Place c5000m. Today, you make your first foray onto the mountain, by climbing to Canadian Place, where you spend your first night sleeping above base camp. Overnight in the tents. Camp 2, Nido de Condores 5559m. You can move some light loads up to Nido. It will take you about 3 hours to climb to camp 2 from camp 1, but no more than 2 hours to make the descent all the way to base camp. Overnight in the tents. Climb to camp 1 and camp overnight. This time you leave base camp for the summit. You return for another night in Camp 1. Now acclimatised to this altitude, you will find you sleep better, and awake better-rested and ready for the onwards push to the higher camps. Overnight in the tents. Climb to camp 2 and camp overnight. As before, you will arrive in Nido in time for lunch. Overnight in the tents. Acclimatisation day at camp 2. This day will ensure that when you strike out for the top, you have the final edge to your acclimatisation. Overnight in the tents. Climb to camp 3 at Berlin Huts 5933m. Today you climb new ground and start up the zig-zag path to Berlin Huts. From here you have an excellent view of the mountain, although the top still looks a long way above. Time: 3 hours. Overnight in the tents. Summit Bid 6959m. you benefit from three days in which to reach the summit. This gives you spare time in case of bad weather, but the summit will be attempted on the first day if possible. With an early start, the summit is attainable in about 10 hours. Overnight in the tents. Last night on the mountain. Return to base camp by mid-afternoon to give you time for a shower, to relax and to prepare your bags for the walk outcend and trek to a campsite by the ‘White Lake’ c5000m near Chamlang. Overnight in the tents. Exit National Park and return to Mendoza.Today is a long day’s trek all the way down the Horcones Valley to the National Park entrance. You will need to start early in order to make the journey all the way back to Mendoza today. In the evening the team will have a celebratory meal and no doubt enjoy a bottle of excellent wine. Overnight in hotel. At leisure in Mendoza. A chance to explore the town. Overnight in hotel. Climb an ancient Inca sanctuary in the heart of Chile and enjoy the magnificent views over the Central Andes and the Valle Central with Chile’s capital Santiago! You will be able to see the majestic Aconcagua and Tupungato while enjoying all the emotions and the beauty of climbing a five thousand meter peak. San José is a 5,821m high stratovolcano which is located in the Central Andes on the border between Chile and Argentina.Join us for a unique expedition to this rarely visited area close to Santiago and enjoy one of the most stunning views in the entire Andes. Dates 2019: 12 january – 27 january. Minimum level required: level 1 in mountaineering ability levels - fitness level 3. Cost: Euro 3350 per person. the cost include: services of an Europea Mountain Guide and an Chilean Mountain Guide, local transport as per program, lodging and tent fees, full board in the mountain except lunches and evening meals in Santiago, group equipment, mules, first aid kit for both the guide and yourself. The guide will book all Hotel as per program – you pay for these direct as we we go along. Trip meeting point: Santiago del Chile Airport. Local Airport: Arturo Merino Benitez, Santiago del Chile. Arrive in Santiago.We are met at the airport by a private bus for transfer in hotel. night in hotel. Santiago – La Parva 2800m. We meet you at your hotel in the morning. After checking your personal gear, we drive up into the Andes. It is a two-hour drive to La Parva, located just above Santiago, where we set up our first camp 2800m not far from the car. In the afternoon we climb a small peak right next to our camp to start our acclimatization process. After this first hike we enjoy some free time and have dinner. Night in tents. La Parva – Piedra Numerada 3300m. After breakfast we begin hiking up along a river bed. On the way we can see a lot of different bird species, with a bit of luck even some condors. The constantly changing landscape will surprise you with panoramic views, waterfalls and high altitude grasslands. After 4 hours we arrive at Piedra Numerada, at 3300m above sea level. Today, our gear and equipment is carried by mules, which allows us to hike up with just a day-pack for personal items. Overnight in Tents. Piedra Numerada – La Olla 4200m. We hike up for about 5-6 hours to Camp I at 4200m. Now we are in more open and harsher terrain, so we move slowly to allow our bodies to get used to the altitude. We also take our time to set up camp. The rest of the day we hydrate and rest. Overnight in tents. La Olla – Plomo Summit- La Olla. Early morning start with Santiago’s lights shining below us. The walk is on easy terrain and we gain altitude slowly but steadily. We carry crampons with us in case the ground gets icy. After about 6 hours we arrive at the Plomo summit, from where we can enjoy some magnificent views over the Central Andes and the Valle Central. After a while we start walking back down to Camp I where we spend the night. Overnight in tents. La Olla – Piedra Numerada – Santiago. After breakfast we take down the camp and hike back to the car. Our luggage is carried by mules again. Before driving back to Santiago, we celebrate the ascent with a nice lunch. Transfer to the hotel. Night in Hotel. santiago – Los Valdes 2000m. In the morning, a two-hour drive into the Andes brings us to Lo Valdes, a traditional secondary residence area for mountain-lovers, which is also the last inhabited area in the Cajón del Maipo Valley. We drop off our stuff at the hut, have lunch and then go for a short walk in the surrounding areas to start our acclimatization process. Overnight in the hut. Los Valdes – La Planta 3200m. Early drive up to a road junction from where we start hiking. It’s about 5 hours walking to the small Plantá hut which will serve as our San José base camp. Today, we use horses to transport the heavy load. We set up camp, hydrate, rest and have dinner. Overnight in the tents. Planta rest. We are at the foot of two majestic volcanoes: San José and its twin Marmolejo, a 6,110m high peak, well known for being the southernmost six thousand meter peak in the world. At the same time, we are facing several 5,000 meter peak ranges with theirs walls and glaciers. We use this day as an acclimatization day, which means that we go on a four-hour trek in the surrounding areas. Back at the camp, we enjoy a cup of tea, get some rest and have dinner. Overnight in the tents. Planta – Camp 1 4600m. It is a 6-hour walk to our next camp. Each participant carries his personal equipment in his backpack, while the common gear (such as food and tents) is transported by porters. Overnight in the tents. 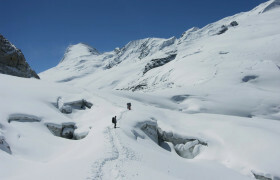 Camp 1 – camp 2 5100m. We keep moving up to Camp 2, our last camp at 5100m. This takes about 5 to 6 hours again, first on steeper terrain and then on a long, gentle ascent. Again, upon arrival we set up camp and melt snow to make water. Rest and prepare for the summit day. Overnight in the tents. Camp 2 – summit 5821m – camp2. The summit day is a round trip of about 6 to 7 hours. We leave our camp at about 7-8am, depending on the conditions and the wind. The last 100 meters consist of lava debris, a bit hard to climb up but very easy to slide down. We enjoy the summit, surrounded by the giants of the area such as Marmolejo, Cº Castillo, Punta Zuni, Cº Arenas, Cº Loma Larga, etc. After a while we go back down to Camp 2. Overnight in the tents. Camp 2 – Planta. Back to Plantá where we find all the comfort of our base camp, including a delicious meal prepared by our cook. Overnight in the tents. Planta – Los Valdes – Santiago. We walk back to the cars and then drive down passing Lo Valdés. We have lunch on the way and keep driving down to Santiago. Transfer to the hotel. Night in hotel. This is a unique program that invites you to complete an expedition to the highest mount that gives its name to the Cordón Del Plata Trekking and Mountaineering School, the most important in Mendoza province. 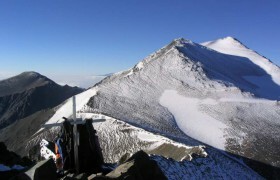 The El Plata Summit or Vallecitos Summit is the goal of mountaineers from all latitudes and the sport and nature contemplation aspiration of thousands of visitors that come to the province every year and who in their travels treasure an experience as unique and exclusive as this magnificent hill. Dates 2019: 02 february – 16 february. the cost include: services of an Europea Mountain Guide and an local Mountain Guide, local transport as per program, lodging and tent fees, full board in the mountain except lunches and evening meals in Mendoza, group equipment, first aid kit for both the guide and yourself. The guide will book all Hotel as per program – you pay for these direct as we we go along. Mendoza. All equipment and food receives final checks and the group prepares loads for carrying up the mountain. Night in hotel. Mendoza – Vallecitos 2850m. Meeting in hotel at 9.00 am. Transfer by car to Vallecitos charter (2850 m), located some 80 km from the city. In Vallecitos we will settle on a typical mountain lodge where we will spend three nights. Lunch. Afternoon: short acclimatization hike around the area. The options are to access the Veguitas (3200m), place used as the first high camp on mountain ascent of considerable height in the area or a short climb to the hill Andresito (3200). Panoramic view of the cordon and valleys. Return to the refuge. Overnight in hut. Acclimatisation day. This day will be dedicated to the ascent of 4 hills belonging to the small mountain range called “La Cadenita”. The hills are: Lomas Blancas (3850) El Estudiante (3900), Caucaso (4050) and Iluso (4150). From the top of them you can get an amazing view of the entire region. Lunch Run. In the afternoon we will return to the hut. Dinner and team preparation for the next day. Overnight in hut. ascent Cerro San Bernardo 4300m. We will have an early breakfast. The idea of the day is the attempted ascent of Cerro San Bernardo, from 4300 m To arrive at their desired summit we go through the camp Las Veguitas and from there ascend through stone and snow corridors to the summit. The output will be very early, to take advantage of the full day increase our chances of success. In the afternoon, we will back to the hut. Overnight in hut. Hut – Piedra Grande Camp 3500m. Ascent to camp Piedra Grande. Hydration Set up camp. Overnight in tents. Piedra Grande camp – El Salto camp 4200m. Ascent to Camp El Salto (4200 m). Acclimation, hydration. Rest. Overnight in tents. Rest day. This day will be the acclimatization for higth altitude. Short walks around the area. Good nutrition and hydration. Overnight in the tents. El Salto camp – La hoyada Camp 4700m. Ascent to camp El Salto camp. Hydration Set up camp, rest and overnight. Overnight in the tents. Summit day. Summit climb the hills Vallecitos or El Plata (as weather conditions and group). We left very early. This will be a very stressful day. Return in the evening to the camp of El Salto. Overnight in the tents. For acclimatisation: Colca Trekking, Source of Amazon River trekking and Volcan Mismi are very easy and not very chalanging. But – anyway – are very nice trekkings with little climbing at the end. El Misti is an active and very symmetrical volcano towering over the white city of Arequipa, the second largest city in Peru. El Misti is known as somewhat of a tourist mountain because many travelers to Arequipa see this spectacular mountain and decide to give it a try. Chachani is one of the easiest 6000m peaks (Grade F, 3 days) along with El Misti which is in close proximity. 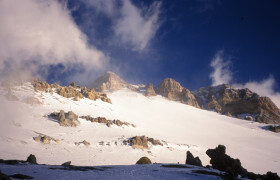 The altitude is the biggest concern for climbers. Crampons and an ice axe are the equipment of choice. Dates 2019: 08 – 23 june. Cost: Euro 2800 per person. the cost include: services of an Europea Mountain Guide and an local Mountain Guide, local transport as per program, lodging and tent fees, full board in the mountain except lunches and evening meals in Arequipa, group equipment, first aid kit for both the guide and yourself. The guide will book all Hotel as per program – you pay for these direct as we we go along. Trip meeting point: Arequipa Airport. Arrive in Arequipa.Fly via either Lima or other city, depending on the best flight schedule. Arrive in Arequipa in the early afternoon. We are met at the airport by a private bus for transfer in hotel. night in hotel. 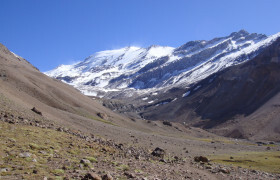 Arequipa – Salina Simbral 4500m – arequipa. Acclimatisation day. Night in hotel. Starting the Colca trekking. Transfer by car to the small town of Cabanaconde 3287m and from here hiking to San Juan de Chuccho 2400m. Overnight in typical hut. San Juan de Chuccho – Sangalle 2200m. On this day we will hike to Tapay, continuing to the villages of Coshńirhua, Malata, and to arrive at the oasis of Sangalle. Overnight in bungalow. Sangalle – Cabanaconde – Chivay 3600m. Back up to Cabanaconde and with the local bus to Chivay. Overnight in family lodge. Chivay – Lari – Qolpa 4450m. Travel by 4×4 to Lari and from there hiking to Qolpa. Overnight in tents. Qolpa – Passo di Apacheta 5105m – Carhuasanta 4700m. This day will be the acclimatization for higth altitude. Good nutrition and hydration. Overnight in the tents. Carhuasanta – Mismi base camp 5150m. Hiking to Mismi base camp 4.00 hours. Hydration Set up camp, rest. Overnight in the tents. Summit 5585m – Arequipa. The hike up takes not more than 4 hours and 1 hours back to base camp. Return to Arequipa. night in Hotel. Arequipa – Misti base camp 4800m. We will leave from the City of Arequipa and we will head by 4×4 to 3300m. From here we will walk until we reach the base camp. Overnight in the tents. Summit 5825m – Arequipa. After breakfast we will leave at 3 in the morning to reach the summit 5825 m, and then we will descent from the summit until 3300m, where our car will be waiting for us. Return to Arequipa. night in Hotel. 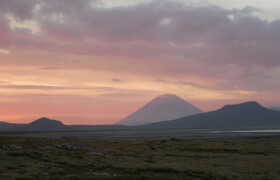 Arequipa – Chachani base camp 5170m. We will leave from the City of Arequipa and we will head by 4×4 to 4200m. From here we will walk until we reach the base camp. Overnight in the tents. Summit 6075m – Arequipa. After breakfast we will leave at 3 in the morning to reach the summit 6075 m, and then we will descent from the summit until 4200m, where our car will be waiting for us. Return to Arequipa. night in Hotel. Dates 2019: 20 july – 04 august. Cost: Euro 2700 per person. the cost include: services of an Europea Mountain Guide and sherpa mountaineer, local transport as per program, lodging and tent fees, full board in the mountain except lunches and evening meals in Leh and Delhi, group equipment, local porters, first aid kit for both the guide and yourself. The guide will book all Hotel as per program – you pay for these direct as we we go along. A visa is required for entry into INDIA. This should be obtained directly in India when arrive in Delhi airport. Arrive in Delhi.We are met at the airport by a private bus for transfer in hotel. night in hotel. Exploring the city of Leh. You have two days to relax and stroll around Leh and allow your body to acclimatise. There are plenty of distractions in Leh, varying from scenic and cultural to gastronomic. There are options of visiting the 11th century monastery at Alchi and the famous Khardung La pass (the highest motorable road in the world). Night in hotel. Trek to Shang Phu 4365m. In the morning you visit the Thiksey Monastery and then continue to Shang. The walk begins up a stony valley and there are several river crossings en route to Sumdo 3800m, your first campsite (3 hours walking). The next day you head directly up the valley to Shang Phu at an altitude of 4365m to complete a total of 5 to 6 hrs walking. Overnight in tents. Cross the Shang La 4960m. Today you traverse across spurs and passes through an area that is very rarely visited. It’s a 6 – 7 hour day and the toughest non-summit day of the trip, as you climb 900m to a high point on the Shang La. Following the crossing of the pass you descend to the Tokpo River, then trek downhill to camp at Gangpoche 4435m. Overnight in tents. Trek to Smankarmo 4380m. In the morning you cross the Matho La 4965m from where you have views of Stok Kangri and then descend into the valley to the north of Stok Village. This lovely valley is a high and wild area, which is visited only by climbing groups and by the local people. You camp near Shepherds huts at Smankarmo 4380m after 4 to 5 hours of walking. Overnight in tents. Trek to Stok Kangri base camp 4980m. A two hour trek takes you up to the base camp area for Stok Kangri. Overnight camp. Acclimatisation walk to 5400m. You spend today walking up towards what used to be Advanced Base Camp (camping here is no longer allowed) before returning to base camp. The walk is on moraine to the edge of the glacier. Overnight in the tents. Rest day and time for final preparations. Overnight in the tents. Summit day. Summit day begins well before dawn, to give you ample time for the climb. The nature of the route depends on the snow cover. It is likely that you do not need crampons for the most part as you scramble over scree and boulders, which lead up to the south ridge. The 450m ridge to the summit is exciting and superbly exposed, although never particularly steep. Most of the ridge is like a steep path, so ropes are not usually necessary, although some scrambling is required. The summit is festooned with prayer flags and after enjoying the views, you descend to base camp for the night. This is normally a 12 – 14 hour day Overnight in the tents. Trek to Stok from base camp. From base camp you trek directly down the valley towards the village of Stok. This is a delightful walk through a dramatic canyon with amazing red sandstone formations (6 hours). Your transport meets you to take you back to Leh. Night hotel. Fly Leh to Delhi. Night hotel. Dates 2019: 06 october – 29 october 2017. Cost: Euro 4300 per person. Kathmandu – Lukla – Trek Poyan 2800m. Early morning Twin Otter flight to Lukla 2840m, the gateway to the Khumbu Valley. You trek in the opposite direction to those heading up the Everest trail. Overnight camp. Trek to Pangkongma 2846m. Cross a ridgeline and descend to the Khare Khola before climbing steadily up to Pangkongma. Overnight camp. Trek to Nashing Dingma 2600m. Climb through rhododendron forest and bamboo to reach Pangkongma La. You then descend, cross a rope bridge spanning the Hinku Khola and climb up to an excellent campsite at Nashing Dingma. Overnight camp. Trek to Chalem Kharka 3600m. Gaining height gradually through pasture and lush greenery, the trail steepens as you climb up to the Surke La. Eventually you’ll reach an attractive campsite set among fir trees and rhododendron bushes. Overnight camp. Trek to Chunbu Kharka 4200m. The trail emerges from the last traces of rhododendron and the terrain becomes more rugged. You pass through high grazing country and cross a small pass to arrive at Chunbu Kharka, a campsite located in the base of a corrie. Overnight camp. Acclimatisation day at Chunbu Kharka. Rest day. Overnight in the tents. Descend to Khote in the Hinku Valley 3550m. The trail contours high above the Hinku Valley until you make a series of steep descents across scree and then through rhododendron to arrive on the valley floor. You camp beside the river. Overnight in the tents. Trek to Tangnag 4360m. You follow the west bank of the riverbed up the valley to Tangnag. Overnight in the tents. Trek to Dig Kharka 4650m. The trail swings to the east and you gain height gradually until you arrive at Dig Kharka, close to the foot of the Hinku Nup Glacier. Overnight in the tents. Ascend to Khare 5100m. A pleasant path continues to Khare, where you camp just below the Mera Glacier. Overnight in the tents. Cross the Mera La 5400m to Mera Peak base camp 5300m. You scramble up rock steps to gain the glacier where you rope up and put on crampons. Snow slopes are followed over the pass and you descend to rock shelves on the far side where you set up camp. Overnight in the tents. Acclimatisation/skills referesher day at base camp 5300m. A chance to practice your fixed-rope and abseiling skills. Overnight in the tents. Move to High Camp 5800m. It takes half a day to follow easy angled snow slopes to high camp, making sure you avoid crevasses. Overnight in the tents. Mera Peak Ascent 6476m. As the sun rises Mera’s central summit soon appears above the head of a wide glacier flanked by two ridges. You climb open snowfields to reach a classic snow ridge just below the final steepening. This 50m snow slope is climbed using a Jumar. On the summit there’s time to soak in a jaw-dropping panorama of many of the world’s highest peaks. Overnight in the tents. Spare day. In case of bad weather. Overnight in the tents. Return to Lukla.The direct route back to Lukla over the Zatrwa La 4600m takes four days. Overnight in the tents. Fly Lukla to Kathmandu. Night in Hotel. At Leisure in Kathmandu. A chance to explore the bustling capital, with its beautiful temples and bustling markets. Night hotel.